A range of milestones have been achieved in Docklands in 2018, with over one million square metres of commercial floor space and 10,000 apartments delivered or under construction, signalling how far the precinct has come. Development Victoria’s Group Head Precincts, Mr Geoff Ward, said the level of investment in Docklands by both the private and public sector was a vote of confidence in the precinct. Waterfront City – Urban Alley Brewery: A 690-capacity brewery within The District Docklands (September 2018). Waterfront City – Archie Brothers Cirque Electriq: An entertainment complex featuring arcade games, theme-park activities and bowling within The District Docklands complex (September 2018). Melbourne Quarter – One Melbourne Quarter: Completion of a 12-storey, 25,000m² commercial building in Collins Street, including a Sky Park (October 2018). NewQuay – Elm and Stone: Upcoming completion of two towers, one with 34 lots and 108 apartments and the other 128 serviced apartments managed by Quest Apartments (December 2018). Waterfront City – Hoyts Cinema: Upcoming completion of an eight-screen Hoyts Cinema complex (December 2018). Collins Square – Tower 5: Upcoming completion of a 65,000m² commercial tower, the final stage of Walker Corporation’s $2.5 billion Collins Square development (to be completed in December 2018). Victoria Harbour - No. 1 Collins Wharf: Upcoming completion of Lendlease’s residential tower with 321 apartments (to be completed in December 2018). Melbourne Quarter – Stage R1: The first residential tower within the precinct will feature 45 storeys and 719 apartments (stage release in February 2018). Melbourne Quarter – Stage C3: A 49,000m² commercial tower which will also deliver 500m² of community space (stage release in March 2018). Waterfront City – The Market: A new fresh food offering at The District Docklands which will include a full-line Woolworths, Dan Murphy’s, an Asian grocer, Priceline Pharmacy and a range of specialty retailers (commenced construction in May 2018). Yarra’s Edge - Wharf’s Entrance Stage 3 Terraces: Early works for 18 townhouses (commenced in July 2018). Victoria Harbour - Stage Y3: Construction of 38,000m² commercial tower under construction (practical Completion is expected March 2019). Collins Square – undercroft: Works completed on the undercroft area in Village Street with new tenants meeting the socio- economic criteria of accommodating charitable organisations (January 2018). Under croft lighting project completed as a collaborative place-making project between Development Victoria and Walker Corporation (August 2018). Docklands Representative Group: Formation of a new-look community representative group (July 2018) with the assistance of Development Victoria and the City of Melbourne. Docklands School: Settlement of the land allocated for the new Docklands School (August 2018). Port Phillip Ferry: $6 million in Victorian Government funding for a three-year trial of a commuter ferry service between Geelong and Docklands (August 2018). NewQuay: Launch of the first stage of NewQuay Central Park, which will eventually become a 4,000m² linear park extending to Ron Barassi Senior Sports Reserve and the end of NewQuay (November 2018). Channel 7 building: Development Victoria acquires the Channel 7 building as part of the overall redevelopment plans for The Docklands Stadium precinct (May 2018). Stadium upgrade: Major upgrade announced of Marvel Stadium and surrounding stadium precincts (May 2018). 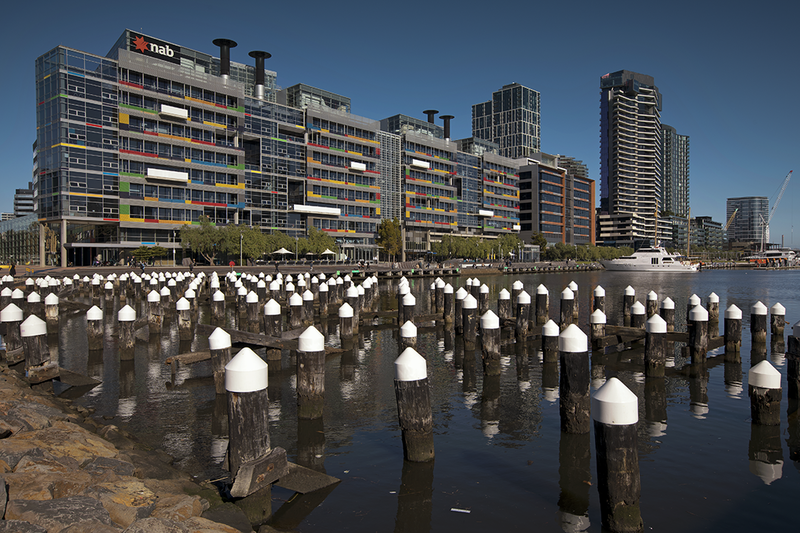 By 2025, Docklands is forecast to welcome approximately 20,000 residents and 70,000 workers, with $17.5 billion of private investment into the precinct. I visited Docklands a few time in the last 6 months. It is a beautiful waterfront place but it is also a disappointing one. There are only a few public toilets and they are very filthy, especially the one near the little park (Collins street expansion). There are rubbish and littering along the promenade and I did see anyone collecting it every time I came. Many rubbish bins were full over the weekend. I hope these are only short term issues. Please keep Docklands clean!